"Thank you for your excellent guidance during our trip to Ecuador. The trip was very good, and the logistics and handling of the group were excellent"
One of our most popular tours - Andean culture, Amazon rainforest, volcanic countryside, colonial cities, the Galapagos Islands – this is Ecuador, home to arguably the most spectacular array of natural and cultural diversity anywhere. This fascinating tour takes you into the Galapagos Islands – one of the most undisturbed and incredible eco systems on earth with it’s incredibly unique species and the home of Darwin’s theory of evolution. 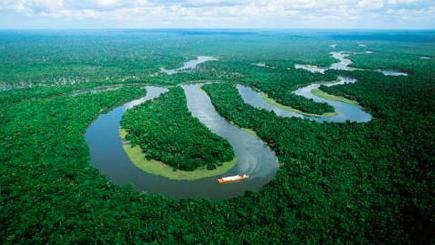 Then, head into the heart of the Amazon rainforest with it’s multitude of plants, birds and animals. Hike, canoe or simply sit on your private cabana’s terrace and see the greatest bio-diversity in the planet as well as learning about the indigenous Achuar Indians. And explore Quito, with it’s UNESCO colonial centre and countless museums as well as a visit into the spectacular Andean foothills and a stay in a local hacienda in Otavalo, the continent’s most famous trading fair. And afterwards, the opportunity to extend your trip into Peru including Cuzco & Macchu Picchu and the fascinating Inca culture. Featuring the M/N Santa Cruz II and Sacha Lodge as described in our various articles in the Medical Post and Doctors Review. To read more please see our 'Featuring Doctors-on-Tour' section! Embark on a five-day cruise of the Galapagos Islands with expert naturalist guides - swim with the sealions and see blue-footed boobies, iguanas, unique bird life and so much more! Visit to the M/N Santa Cruz II's ship’s hospital and meeting with the ship's doctor to review on-board medical equipment and learn about common medical ailments at sea. Presentations on traditional healing methods by a shaman in one of the local Amazonian communities close to Sacha Lodge. Round trip international flights from Toronto to Ecuador (into Quito / out of Guayaquil) as per detailed itinerary. Travel insurance – please note, travel insurance (including medical and trip interruption coverage) is highly recommended for this tour. Coverage is available through doctors-on-tour – please check for further details in our brochure. Our popular Ecuador and Peru programs have also been featured in various articles including in the Medical Post (on the Galapagos Islands and the Ecuadorian Amazon) and Doctors Review - click on the hyperlinks to view.